For the first giveaway this month, Hijab Style is giving you the chance to win a ring of your choice from The Inayah Collection! 1. Visit The Inayah Collection Facebook page, and tag yourself in the photo of your favorite item. 2. Send an email in with the link to the photo you've tagged youself in, along with your full name and city with 'April Giveaway' in the subject line to hijabstyle@hotmail.co.uk. Please note that if any of this information is missing, you will not be entered into the competition. 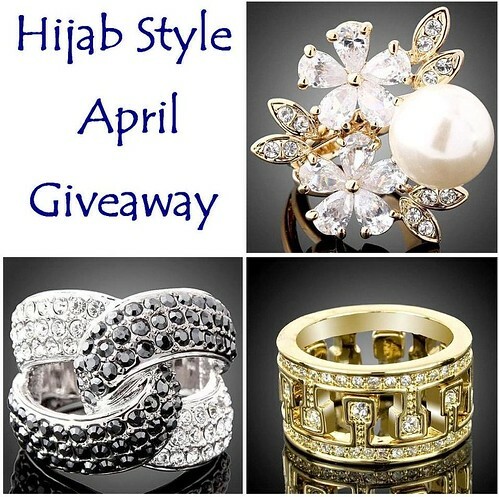 Extra Entries: You can get an extra entry into the giveaway when you follow Hijab Style on Twitter! Simply send in a separate e-mail with your full name and link to your Twitter profile. The deadline for entries is midnight GMT on Saturday 9th April 2011. The winner will be chosen at random and contacted via e-mail. salam, I'm from Indonesia. Can I join too?